Homelessness is a social problem which touches every community in this country. Veterans are one of the most vulnerable populations who are more likely to become homeless at least once during their lifetime. Often, veterans who survived combat missions overseas suffer from post-traumatic disorders and have issues with substance abuse. Eventually, these factors contribute to a loss of social connections and home. Veterans Affairs services are conditional and often restricted to veterans only, which might not be adequate for the veteran family to stay housed. Homeless shelters provide a very short-term solution. However, they are not enough to prevent chronic homelessness amongst single veterans and veteran families. According to the 2015 Annual Homeless Assessment Report (AHAR), in January 2015, 47,725 veterans were homeless on a single night. Fewer than 10 percent (4,338) were women. The good news is between 2014 and 2015, homelessness among veterans declined by 4 percent. Between 2009 and 2015, homelessness among veterans declined 35 percent. 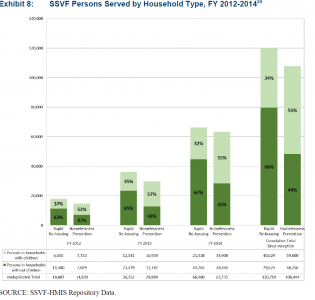 It was expected that the veteran homelessness would end by 2015. The goal has not been reached but it emphasizes that communities should have a system in place to ensure newly homeless people do not stay homeless for an extended period of time. Section 604 of the Veterans’ Mental Health and Other Care Improvements Act of 2008, Public Law 110-387, authorized Veterans Affairs (VA) to develop the Supportive Services for Veteran Families (SSVF) Program. Supportive services grants will be awarded to selected private nonprofit organizations and consumer cooperatives that will assist very low-income veteran families residing in or transitioning to permanent housing. Grantees will provide a range of supportive services to eligible veteran families that are designed to promote housing stability. 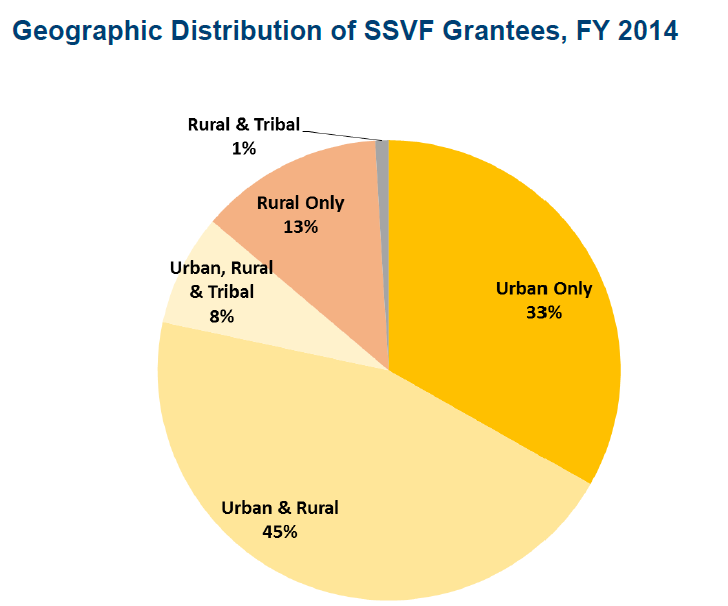 The SSVF program is unique because it provides additional supportive services such as outreach, case management, connection to benefits and programs, connection to public benefits, community resources and temporary financial assistance (TFA). TFA is paid directly to the third party on behalf of a participant for rental assistance, utility fee payment assistance, security deposits, moving costs, etc. The SSVF program has grown significantly since its inception. It started with approximately $60 million and was awarded to 85 grantees in 40 states and District of Columbia. At the time of publication of the 2014 Annual report, awards announced in FY2015 have further expanded SSVF services to 400 of 416 Continuum of Care (COC). Being homeless is still taboo and often poses a challenge to outreach workers. However, with immense economic growth in certain pockets of the country such as Silicon Valley, Los Angeles and New York, it is an unfortunate truth. Unlike overnight shelters, SSVF programs often act as a preventative care from the risk of being homeless. SSVF has also placed greater emphasis on integrating its service with other community providers. SSVF grantees participate in Homeless Management Information System (HMIS) and use coordinated assessment to serve its clients. SSVF employs the “Housing First” approach which is different from permanent supportive housing programs. Under this model, participants have access to permanent rental housing as soon as possible without any precondition. The underlying theory is housing first model facilitates much-needed health care, employment legal services, and other supports to sustain permanent housing and improve one’s quality of life. SSVF is also different from some other VA programs as it can provide service to the entire family instead of just providing service to the veteran. All projects participating in HMIS, including SSVF projects, are expected to understand and follow COC’s data quality plan which provides detail baseline standards for all project participating in HMIS. 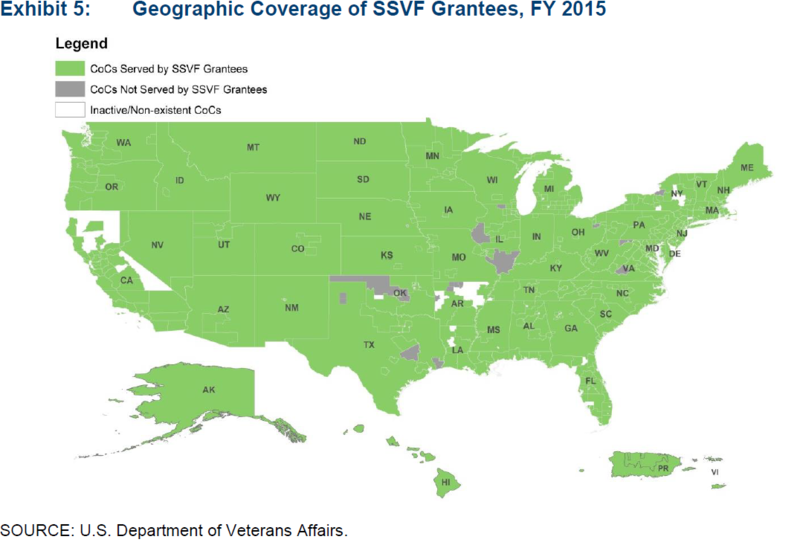 SSVF grantees must also meet the additional data quality requirements established in their VA grants. Timely entering of data is paramount as SSV grantees data must be exported to the VA Repository by the fifth business day following the end of the month. The unprecedented partnership between formed between VA, SSVF, and local communities has significantly decreased the homeless population. In December 2013, Phoenix became the first major city to end chronic homeless among veterans. The success was followed by Salt Lake City, New Orleans and Houston reached the goal of ending homelessness by June 2015. All the cities noted that SSVF program played a significant role in reaching the goal of ending homelessness. Author: Mohua Chatterjee is a 2016 Founders’ Fellow and a graduate student at San Jose State University.